« Is the HSUS (Humane Society) really who you think they are? THIS POST IS NOT FOR THE WEAK AT HEART. IF YOU CANT TAKE THE TRUTH ABOUT PETA THEN LEAVE NOW! An official report from People for The Ethical Treatment of Animals (PETA) shows that the animal rights group put to death more than 97 percent of the dogs, cats, and other pets it took in for adoption in 2006. During that year, the well-known animal rights group managed to find adoptive homes for just 12 pets. The non-profit Center for Consumer Freedom (CCF) is calling on PETA to either end its hypocritical angel-of-death program, or stop its senseless condemnation of Americans who believe it’s perfectly ethical to use animals for food, clothing, and critical medical research. Not counting animals PETA held only temporarily in its spay-neuter program, the organization took in 3,061 “companion animals” in 2006, of which it killed 2,981. According to Virginia’s Department of Agriculture and Consumer Services (VDACS), the average euthanasia rate for humane societies in the state was just 34.7 percent in 2006. PETA killed 97.4 percent of the animals it took in. The organization filed its 2006 report this month, nine months after the VDACS deadline of March 31, 2007. In courtroom testimony last year, a PETA manager acknowledged that her organization maintains a large walk-in freezer for storing dead animals, and that PETA contracts with a Virginia cremation service to dispose of the bodies. 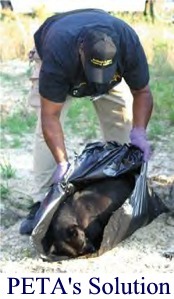 In that trial, two PETA employees were convicted of dumping dead animals in a rural North Carolina trash dumpster. In Southampton County, Virginia, another PETA employee currently faces criminal charges in a dog-napping case. Andrea Florence Benoit Harris was arrested in late 2006 for allegedly abducting a hunting dog and attempting to transport it to PETA’s Norfolk headquarters. 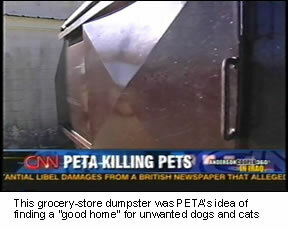 CNN News with more proof that Peta is not a friend to animals, gamefowl, poultry or even remotely close. They are however getting rich from supporters that seek not the truth. When will Animal Rights Supporters realize that these radices’s groups including the HSUS are in for money and not for their love for animals? If you missed my last article on Is the HSUS (Humane Society) really who you think they are? you should read it now. This entry was posted on January 20, 2008 at 7:55 am	and is filed under Animal Rights, ARA, Cats, Charity, Dogs, Family, HSUS, Humane Society, Life, Love, PETA, Pets. 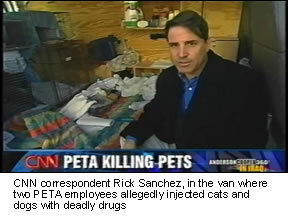 Tagged: animal death, death, People for the Ethical Treatment of Animals, peta kills animals. You can follow any responses to this entry through the RSS 2.0 feed. You can leave a response, or trackback from your own site. PM took Mr. Berman’s suggestion and formed the “Guest Choice Network,” changing its name in recent years to the “Center for Consumer Freedom,” which in addition to fighting smoking bans also fights the organic food movement and lobbies against lowering the legal blood alcohol limit for drunk driving. I was never for Peta and I never will be but the people who are being brainwashed to send peta money to fund their killing spree should be aware of all this. No animal lover would ever think that the killing of a beloved pet is better for it then finding the loving home it deserves. Peta can not get away with their crimes! Don’t Peta have their initials on thier Biohazard suits? 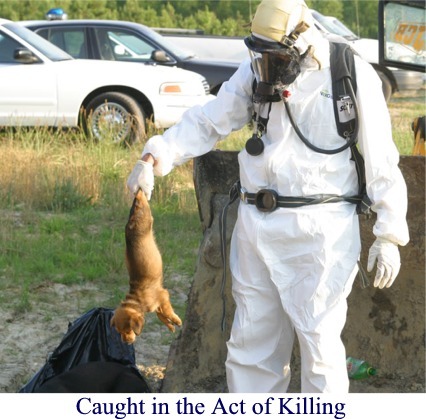 And why are they wearing biohazard suits to kill a dog? I don’t think it’s what it says. That is terribell you should get this published so everyone can see what petas really like!!!! !